There’s no place I’d rather live than the Pacific Northwest in the summer. It’s beautiful up here, and with the mild (and mostly dry) weather, there are many opportunities to enjoy it. 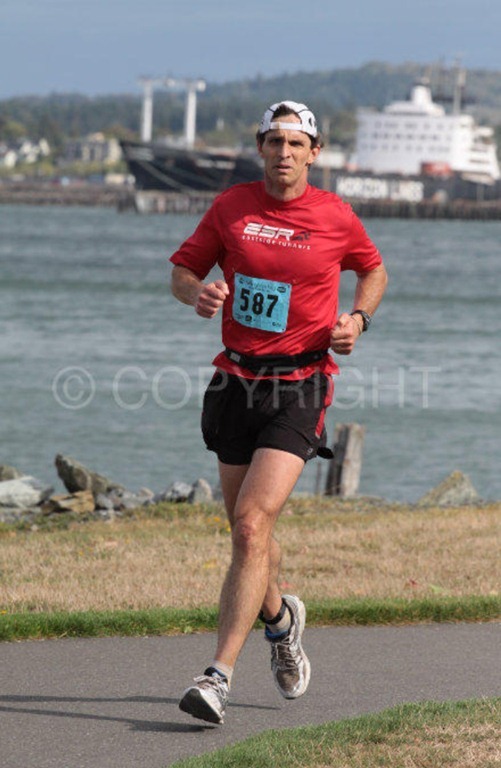 This is exactly what I was thinking when I registered for the Bellingham Bay Marathon. It was to take place on September the 25th. In my seventeen years of living here, that permits me exactly one week of summer weather before the curtain of fall descends, and we have a steady mist that will persist until the following July. Perfect! Imagine my shock when I arose on race morning to hear the steady drumming of rain outside. 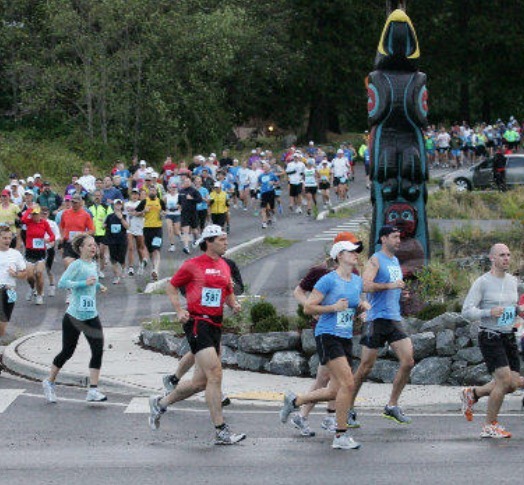 The marathon is a point to point run, starting at the Lummi Nation School, on Gooseberry Point, northwest of the city. The busses leave downtown Bellingham at O’Dark Early, bringing us out to the school. By the time we lined up for the start, the sun has come up, and the rain had stopped. It felt a bit warm and muggy. However, this calm turned out to be pretty temporary. They sent us off promptly at 7:30. As we crested a hill leading us out to the shoreline, the wind really picked up. 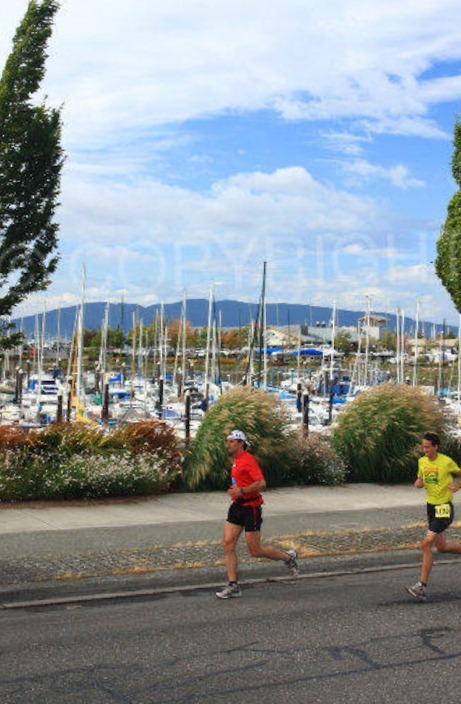 It was a nice tailwind – made me feel like I was running downhill as we wound along Bellingham Bay. Looking at my mile splits, I was a bit concerned that I was taking the early miles a bit too fast. I’d ease off a little bit, but would click off another brisk one. I blamed it on the tailwind, and enjoyed the nice view across the bay. We turned inland just before hitting mile 6. The tailwind became a crosswind, and we continued on some gentle rolling country roads, followed by a stretch on some paved trails. I felt like I was working harder than usual, just to hold a straight line with the crosswind – I remember observing a line of runners in front of me, all leaning into the wind – almost like sailboats. I wish I’d taken a picture. Things got more interesting when we turned to the south, as we ran just to the west of the Nooksack River between mile 11 and 12. The crosswind became a headwind, and the difference to my mile pace was marked. Some of that was fatigue. But a big part of it was the wind. 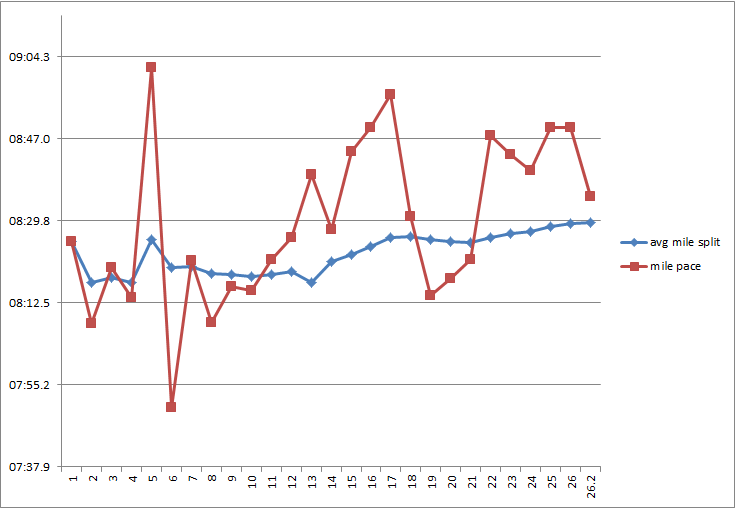 Employing my Chi Running tricks (straight column, forward lean, gliding steps) didn’t stop it from feeling like work. By the time we merged with the half marathoners around mile 17, I was definitely feeling it. My mile splits were slower, but still respectable enough. We wound through neighborhoods for a couple of miles, eventually landing on a trail heading through Squalicum Creek Park. This was a nice stretch, with clear views out over the bay. The sun had come out too. Whatever sense of tranquility we’d had on the trail went away shortly after mile 20 when we hit the waterfront. The wind had picked up again. It was about now that I saw one of the more unusual things I’ve seen during a race. As ran past the end of a waterfront building, I saw an entire group of runners directly in front of me suddenly shift three feet to the left. I thought they’d jumped to avoid something in the path, but as I found out seconds later – it was a gust of wind. It was the same story heading through Boulevard Park, and got even worse as we ran up the Taylor Avenue dock. As we turned to head up the ramp taking back onto the streets, I was pretty wiped out. I’d stopped looking at my overall time, instead focusing mile by mile. And I was surprised that my splits were still under nine minutes per mile, given how I was feeling. 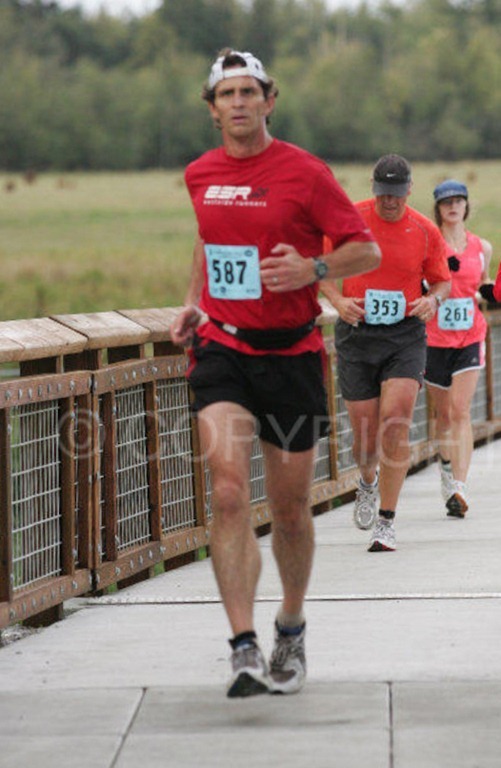 I’d given up on my ‘A’ goal – under 3:35, held faint hope for 3:40, but felt good about my chances for 3:45 or better. The last two miles had us backtrack towards downtown. I was definitely ready to be done too. By the time I ‘d passed the 26 mile mark, I’d slowed to a near-8:50/mile pace. Spent, but happy with my effort, I came in at 3:42:22, my fastest in nearly two years, and third fastest ever. I spent a long time in the finish area – eating a bunch and drinking lots of electrolytes. I got a massage that nearly brought me to tears (apparently I was pretty tight). And I spent some time catching up with running friends, and swapping stories about the “Mighty Wind”. One of the things I love about distance running is the stories we earn and share. And today was a good day – those gusts will increase in speed every time I think about this race. You can pretty much tell where the wind changed, by looking at the splits. Still – a good day. When I used to feel stress at the firehouse … I had the simple solution : Throw on a singlet, put on the shorts, lace up the running shoes and do a hard six miler in the park. Every run solved a problem or reduced its significance. I liked to say a run cleaned the chalkboard of life. A big source of inspiration for me, as I was recovering from my bike accident in 2008 was New York City firefighter Matthew Long. He’d been struck by a bus while riding to work. He suffered extensive internal injuries. Matt was initially given a 5% chance of survival. Yet three years later, he lined up at the start of the New York City Marathon, to run the race of a lifetime. His is an amazing story. I survived because I had trained my heart to do the same. Becoming an Ironman had kept me from becoming a dead man. Matt’s book The Long Run is available in paperback now. It’s a worthwhile read – particularly for those dealing with life-altering injuries. You can check out his interview with Jon Stewart, talking about what he was up against, and some of the things that made a big difference for him. It seemed that with each conversation I had with a doctor, the longer my road to recovery became. I’d first read Matt’s story in the New York Times, just before he ran the 2008 New York City Marathon. I was nearly four months from my own adventure with a negligent driver. Reading about Matt making it to the starting line again gave me a glimmer of hope that I might do the same. Reading and seeing his path to the finish line in Runner’s World in early 2009 was a transformative experience for me. While in my own recovery, one of the things I struggled with the most was setting my own expectations about when or whether I’d get back to where I’d been before the accident. Recovery from a serious injury such as a Traumatic Brain Injury does not have a straight path. There aren’t timelines you can count on. In a situation like that, it’s hard to figure out what a reasonable baseline of expectations is – at work, running marathons, or with life in general. “Matt, come on.” she snapped. “Look how far you’ve come” But I didn’t want to look back. And I couldn’t look forward. I had always lived in the present. I used to wake up every morning expecting to make that day more fun than the day before … Then I got run over by a bus and I couldn’t do anything or see anything. I couldn’t see that last week I had walked 30 feet down a hallway, and this week I walked 60 feet, and next week I might walk 120 feet. I didn’t see that things were doubling. I just saw one thing. Me in a damn wheelchair with a damn colostomy bag hooked to my side. Matt’s story illustrates this difficulty very clearly. Prior to his accident, Matt had completed several marathons – including a personal-best (and Boston-qualifying) 3:13 weeks before the race. He’d also completed Ironman Lake Placid in a very respectable 11:18:01. Everything changed on the morning of December 22, 2005. He had to retrain his body in order to become independent again. In order to start running again, he needed to walk. In order to walk he needed to stand up. In order to stand up, he needed to convince himself that he could do it. Talking about what it took to stand up again only scratches the surface of the degree of challenge Matt faced. Coming to terms with some of the consequences of suffering extensive muscular and nerve damage in his core took several years. Matt’s ability to talk about this will ring true to anyone who’s faced an uphill recovery – focusing on rebuilding both body and your spirit takes incredible determination, and (as Matt tells us) – and incredible amount of support – family, friends, and faith. [The physical therapist] finished by writing, “If you want to run, all the better. I would never tell anyone they couldn’t do what they wanted to do”. One thing to remember is that determination takes many forms. Sometimes it’s digging deeper to run faster or longer than you thought you could. Other times it’s dealing with setbacks and not giving up on yourself. Knowing that if you can’t run today, you’ll try again tomorrow. The power of Matt’s story for me is how he focused on “I Will” instead of feeling defined by what he couldn’t do. It’s the gift of hope. 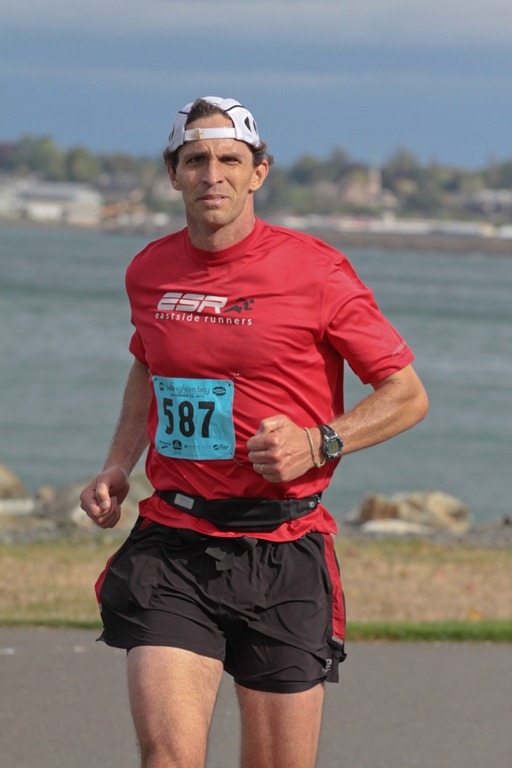 Check out his book The Long Run, or the Runner’s World profile of him.